The benefits of walking to school seem abundantly clear. Walking improves health and fitness. Students who walk or bike to school exhibit better behavior and focus in class. With more kids walking or biking, there will be fewer cars, less traffic congestion and better air quality near the school. So with all the positive outcomes, why don’t more kids walk or bike to school? The foremost concern is safety—both for students who walk alone and for those who do not know the pedestrian and bicycle rules of the road. It can also be difficult to carve out the necessary time to walk or bike with your children in already packed family schedules. Participating in a Walking School Bus program can address these concerns and bring about additional rewards. 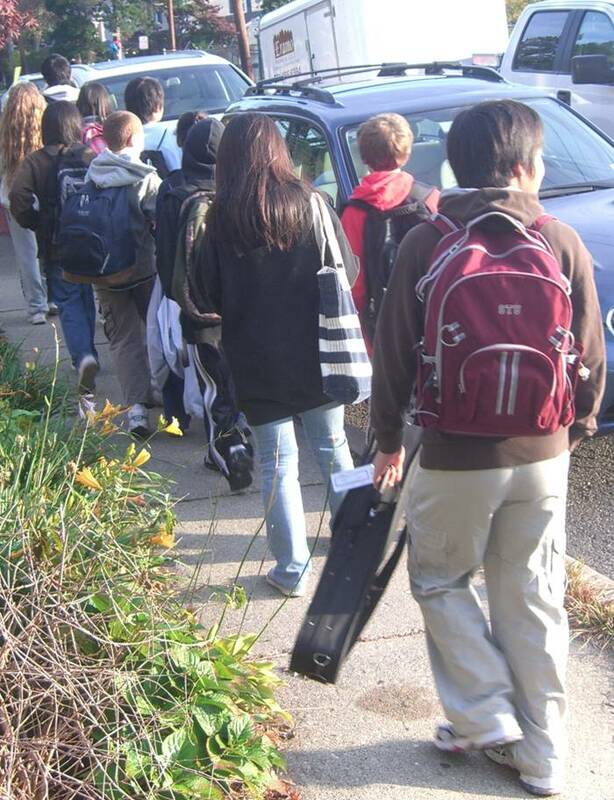 A Walking School Bus is a group of children walking to school with one or more adults. It can be as informal as two families walking to school together. Or, it can be more formally structured with an established walking route, meeting points (stops), timetable and schedule of trained parent volunteers or walking bus “drivers” who can take turns during the week to share responsibility. A successful walking school bus can operate on a frequent basis, such as daily or once a week, or on a more limited basis, such as the first Tuesday of the month or only on special days. Each “bus” is unique and can be custom tailored to fit the needs of any group. A Walking School Bus can be helpful in teaching children about road safety. During the walk, adult volunteers can coach kids on the safest places to cross a street, as well as how to cross at mid-block, main roads and side roads. They can demonstrate the importance of making eye contact with the driver—one of the ways that a pedestrian can be sure that drivers have seen them. A walking school bus is also important to parents who may not initially be comfortable with their children walking to school. The walking school bus addresses many parent concerns related to safety because children are not only walking in a group, but also walking with adult supervision. Who is implementing Walking School Buses? In Middlesex County, Highland Park’s Bartle Elementary School kicked off its Walking School Bus program with about 40 students. Efforts to create the program began as part of the borough’s Mayors Wellness Campaign, a statewide program to encourage healthy living. The program coordinator, Colleen McKay Wharton, has found the borough “very supportive of the program.” The principal, superintendent and the police have helped create the program by identifying safe routes to walk and by getting the word out to the community. Organizers in both Somerville and Highland Park have found that keeping parents involved is vital in making the program a success. Flyers and on-line surveys can be helpful—to communicate to parents and to get their feedback. Active recruitment by the principal can be crucial. In Highland Park, organizers have divided into four districts or neighborhoods, with lead coordinators taking on the role of communicating to parents operating each route. With a formalized program, rules, backup plans for sick or absent drivers, and liability issues are all addressed. This level of organization can be comforting to parents and students who take part. However, creating a formal Walking School Bus may seem too great a task for a parent interested in getting one started. A Walking School Bus does not need to be so formal. Remember — it can be as simple as a few families walking their children to school together. Some communities have built upon their Walking School Bus success by expanding their programs to include kids riding bikes. A Bike Train operates much like a Walking School Bus but is aimed at students who have “aged” out of the walking program and would rather ride to school. Just as a Walking School Bus can teach pedestrian safety skills, a Bike Train can help kids learn bike safety. The Lebanon School District in Hunterdon County has incorporated biking into its walking school bus program. Students in the 4th grade and older receive bike safety education through presentations and videos, all riders must have their bikes pass a safety inspection, and parents must sign an agreement. And, of course, riders must wear a helmet. All bikes are registered and sporadically inspected to ensure a safe trip. In a Bike Train, one adult cyclist for every three to six children is recommended. While it may take a bit of time and some planning to get a Walking School Bus started, the benefits can well outweigh the effort spent working out the logistics. 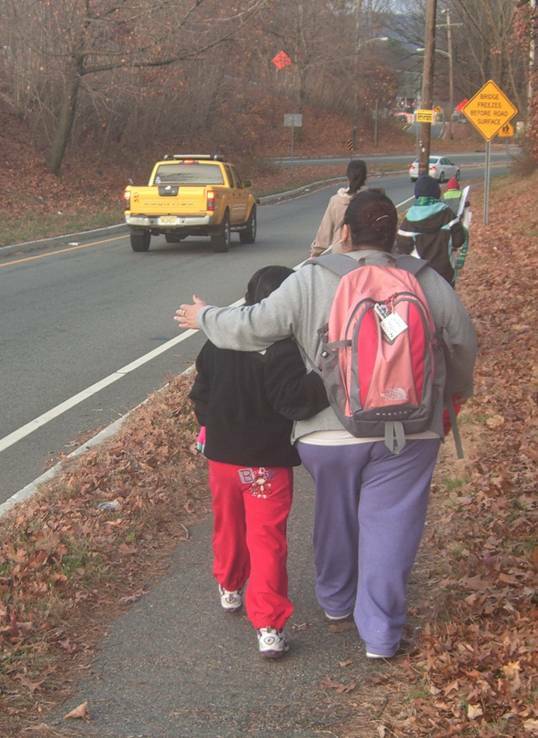 Students who participate in a Walking School Bus can get to know caring adults who support kids. Parents can feel comfortable letting their children walk knowing that they are in a group being supervised by adults. While walking to school, kids can spend some time with their friends, make new ones, and feel like they are part of a worthwhile activity. And perhaps best of all, it enables kids to learn life skills and encourages them to adopt walking as a life-long activity. This entry was posted in Encouragement, Walking. Bookmark the permalink.